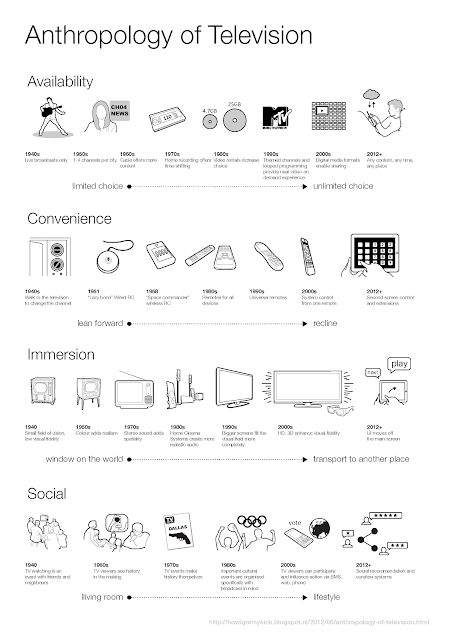 AppleTV, Google TV, Netflix, Ikea Uppleva... So why isn’t TV disrupted already? Where is TV going? 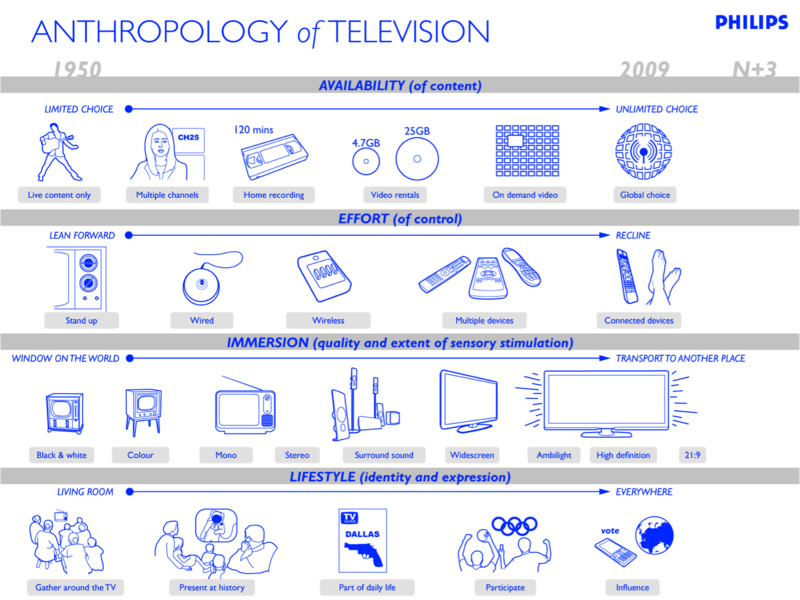 Longer term trends in human behavior can show us where TV is headed. Technology shapes Culture but Culture determines which technologies thrive; and culture changes more slowly than technology. An earlier post looked at television's job to be done. 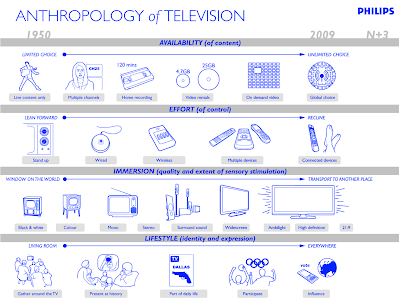 This post looks at the Anthropology of Television. Apps provide new narrow yet deep access to specialized content. User generated content gets integrated with commercial content. The ease of getting the right content for any situation. Increasing visual and motion quality rendering. Apps providing synchronised extensions to content on screen. The social and cultural aspects of our relationship to media; shared viewing enhances the experience. Social currency – know what my peers are talking about. Discover content “gems” that suit me personally. Here is a .pdf A3 format, suitable for printing. This post is an update of a project for Philips Design based on my own independent research and close collaboration with Darrell Chung. Graphic design in this update, as well as the original project was done by Darrell Chung. A slide from the original project is below. Credit for the project should go to Philips Design; I own the mistakes. Thanks to Philips for permission to update and reuse these materials, and to our colleagues at Philips Design who contributed, including: Arjen Benders, Greg Foster, Michael Held, Kim Sung Woo, Low Cheaw Hwei, Low KoWee, Paul Neervoort, Aidan Rutherford, Sajid Saiyed, Celia Wong, Rod White, Yeo Pei Pei. (Anyone I overlooked please let me know). Thanks for reading to the end. Please comment. Please tweet. Technology shapes Culture but Culture determines which technologies thrive; and culture changes more slowly than technology.